St. Louis’ newest brewpub will be opening this week. 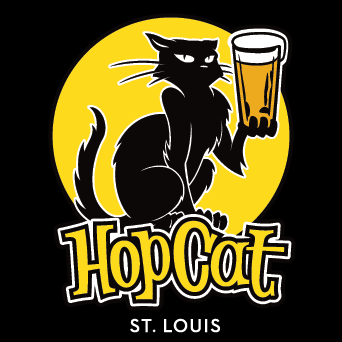 HopCats will make its first pours at its new location at 6315 Delmar Boulevard in University City, MO. I had not heard of HopCats before it was announced the Grand Rapids, Michigan based ‘anti-chain – chain’ was entering the St. Louis market, after opening more than a dozen location around the upper Midwest. HopCats is the brainchild for Grand Rapids native Mark Sellers who says his love of music, specifically jazz, is where the name of the craft beer bar and restaurant HopCat originates. “In jazz, if you’re a cool cat, you’re a hepcat. But beer has hops, so it became HopCat,” says Sellers, HopCat’s founder and CEO in an interview in 2016. HopCat’s first location was established in Grand Rapids in 2008. Five years later, the place known for their famous “crack fries” and craft beers opened a second location in East Lansing. The Detroit HopCat followed suit a few years after that, in December 2014. By the end of this year, there will be a dozen HopCats scattered throughout the Midwest—and even more are on the way. And that brings us to St. Louis. HopCats introduced themselves to the St. Louis beer community in a Facebook post back in May of 2017. To mark the opening, HopCats will feature 80 Missouri-made craft beers on tap — along with free Crack Fries all day for everyone who visits. The first 200 guests at this grand opening celebration even get a card good for free orders of HopCat’s famous fries every week for a year, plus other swag fitting for this unique new beer bar. The tap list consists of its Local 30, made up of 30 Missouri made selections that represent the standards for their style in the Show Me State. These change only on occasion. The rest — 50 taps — rotate to feature the best beers and ciders available, whether they’re a seasonal offering, a rare cellar find or something made just for HopCat. If you have friends who don’t like beer, we’ve got them covered with cocktails, wine and soft drinks. Got kids? Bring ’em. HopCat has got a kids menu and people under 21 are welcome at HopCat until 10 p.m. every night. All Missouri made. All great. Representing a variety of styles. All available every day. These are also part of our Happy Hour program. Happy Hour beers are $1.50 off Monday–Thursday from2-6 p.m. The remaining 50 of the #80MOBeers grand opening list. These rotators will often change. Organized by style, brewery, brand, description, alcohol content and glass style. Rotating taps will feature national craft beers, international selections and a few selections suitable for enjoying after mowing the lawn — think PBR.